Needing some encouragement today, momma? I know I do. Moving to a new state, a new house, unpacking and getting this house in order, all while being 27 weeks pregnant with a toddler hanging off my leg…I need all the encouragement I can get! What about you? 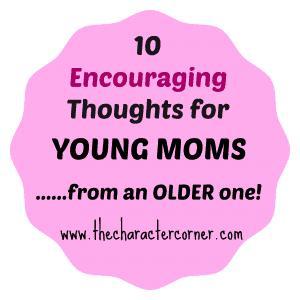 No matter what season of life you are in, as a mom, it is encouraging to hear from a mom who has been there, done that. 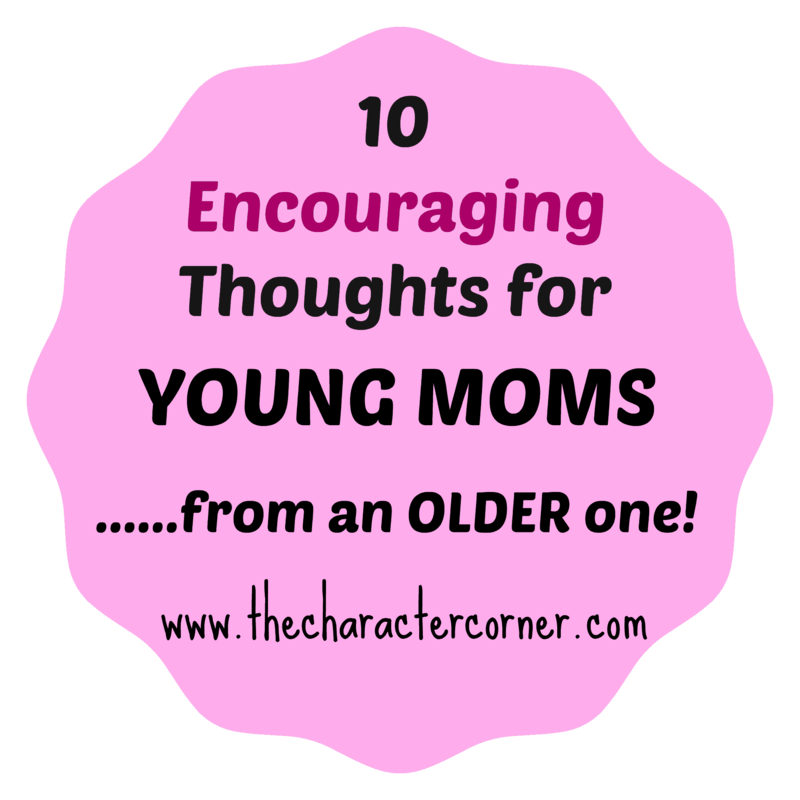 Today, Kathie from The Character Corner is sharing some very encouraging words to those of us who are growing weary…to those of us that feel like we can’t keep up…to those of us who just want a nap! There is good even in the difficult. There is good even in the exhaustion. There is so much good in being a mom!! It is the greatest blessing we will ever experience. Thank you for your encouraging words Kathie! 1. You will be tired; however, you don’t even think about it. You do what you need to in order to take care of those precious little ones! You will sacrifice sleep, time, energy, and money for them without even giving it a second thought, because that’s what moms do. 2. You will get frustrated and stressed at times, or maybe even often, but for every moment of frustration, you will have more moments of happiness and laughter. 3. Your house will be dirty, but not forever. 4. You will feel more love than you’ve known or thought possible. 5. You will develop into a mother bear to protect your child. 6. You will not have much time, if any, alone; later you will wish you didn’t have so MUCH time alone. 8. People will tell you to enjoy it, but some days all you can do is survive. However, there is enjoyment even in those busy, crazy, tired times. 10. At times you will feel like you are a bad mom, and sometimes you just won’t know what to do. Realize that’s where God wants you, because it keeps you depending on Him! You’ve probably heard it often, but it’s true, and you will realize later that “the days are long, but the years are short.“ Realize they may be messy and hard at times, but with God’s help and guidance you will make it through, and be a stronger, better person because of the things God teaches you as you depend on Him through your parenting years. Kathie Morrissey is the mother of 8 children, wife to Alan for 35 years, as well as an author and speaker. She is the founder of The Character Corner, where she loves to blog about parenting, family life, homeschooling, and life in general. Her heart’s desire is to help and encourage parents to be purposeful in raising Godly children, who walk in purity, and have a heart for God. Amen to this! I think being a mom brings us down on our knees, so we can rise higher after. There’s something to be said about strength that is birthed in parenting… nothing, no other mission takes us to the cross more often. Yes?